R-Studio is a comprehensive data recovery and undelete program renowned for its ability to recover mission-critical data lost to viruses, malicious attacks, and hardware failures or operating system crashes. It supports FAT/NTFS (All Windows), exFAT(WinMobile, Windows Vista and Windows 7), HFS/HFS+ (Mac), UFS1/UFS2 & Ext2FS/3FS/4FS file systems and functions on local and network disks, even if partitions are formatted, damaged or deleted. All 64-bit Windows versions are supported. Additional file recovery algorithm increases the quality of file recovery and recovers files not recognized in file system metadata. Dynamic disk and RAID (including RAID 6) are supported as well as recovering encrypted files, compressed files and alternative data streams. Files and file systems structures (NTFS/FAT boot sectors, MFT file record, MBR, LDM structures, etc) can be viewed and edited in the professional disk hex editor. In addition to byte to byte copy of any object visible in the Drives panel, smart copy of partitions and hard drives with size and offset adjustment is available. Extended Viewer Plugin allows viewing a content of the found files to estimate recovery chances prior to purchasing. Flexible parameter settings give you absolute control over data recovery. 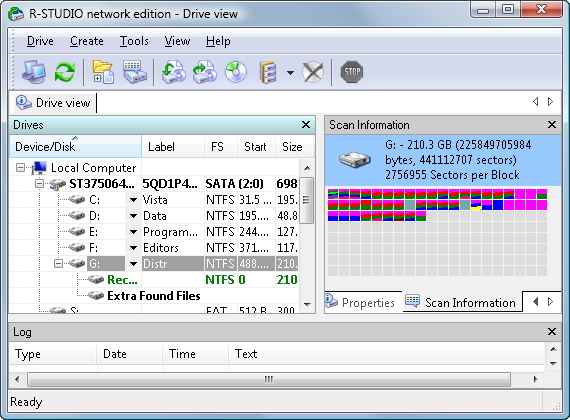 R-STUDIO run in the demo mode allows you to evaluate how the utility recovers lost files. The only limitation is you can not recover files larger than 64KB in the demo mode. All R-Studio versions (except the technician version) are registered on on-the-fly and no reinstallation required. Depending on the registration key the software is activated to local or network version. When R-Studio run in the demo mode has found a lost file larger than 64KB you may simply double click the file to preview it. If you are satisfied with the file content you may buy the R-Studio license, register the software and recover the file right away. Besides compatibility with all 32-bit Windows (Windows95-Windows 7) the R-Studio (+ 64-bit) version supports 64-bit Windows and allows to use all physical memory (RAM) installed on such computers that highly increases a scan performance especially on high-capacity disks. R-Studio Technician package setup files can be downloaded by the software licensee only.